Work on a new environmental water management plan for the Macalister River began in 2014–15 as environmental water continued to target native migratory fish species, including the iconic and threatened Australian grayling. Environmental watering in the Macalister River in 2014–15 aimed to trigger migration and breeding of native migratory fish, boost the strength and diversity of river plants and connect habitat with autumn and spring environmental watering. As in the Thomson system, Australian grayling responded well to environmental watering with monitoring confirming further spawning. Australian grayling eggs were collected in the lower Thomson system, showing that the autumn water delivered through the Thomson and Macalister rivers was able to trigger downstream migration and spawning of grayling. Minna Tom, Environmental Water Officer with the West Gippsland Catchment Management Authority, said the development of the Macalister River environmental water management plan also began in 2014–15. "This important project began with an update to the flow recommendations and early community engagement to ensure that the outcomes of the plan are understood, owned and supported by the community," Minna said. 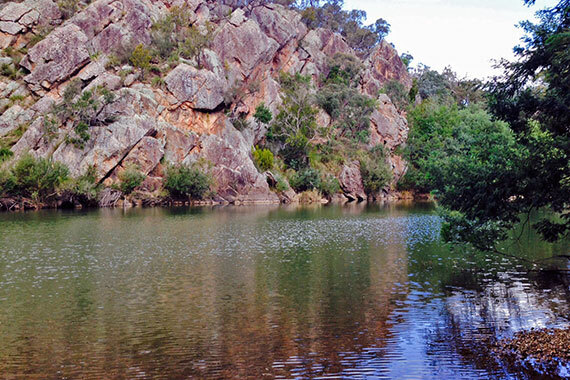 "Water-dependent values and ecological objectives were identified and developed in partnership with a community advisory group represented by local landholders, agencies, Landcare volunteers and other interest groups."